Recorded at Sherbourne Common (Camp Wavelength – Day 1), August 19, 2017. 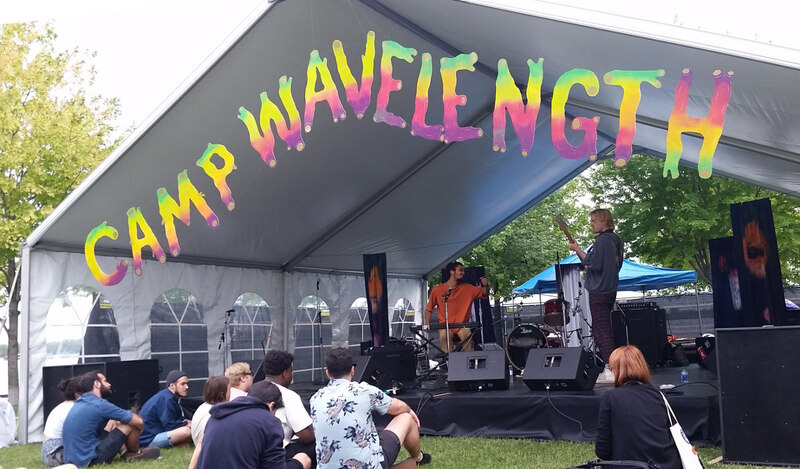 Since 2009, the summer Wavelength festival has been a highlight of the season, slowing down the hectic "festival experience" to an Island pace and making the whole thing as much about the vibe and the location as the (always well-curated) music. When this spring's floods shut the Island down, there was a ripple of apprehension from many quarters at the loss of favourite summer hangs, culminating in the festival decamping to the mainland. Although his music is pure soul, Jean-Sebastien Audet's recordings work on the Guided By Voices principle: if an idea needs forty or ninety seconds to express, that's how much it'll get and no more, then onto the next one. Live, there's less of a cavalcade of fragments as each is turned into a vamp that begins and ends when the feeling is right, like a tap turning on and music flowing out. Good winds blow and good will comes as the audience pulls closer to catch each spark.